UNITED NATIONS, September 21 -- As the UN Environment Program called China an environmental leader Monday for planting 2.6 billion trees, questions arose about the destruction of forests by China and other countries praised by UNEP. Inner City Press asked China's Minster of State Forestry Administration Jia Zhibang how the planting compared to the effects on forest of, for example, China's rubber plantations or Laos, or its export of old growth forest from the Congo. Minister Jia Zhibang responded, through his translator, that "the Chinese government does not encourage illegal logging in any of the countries in which we have investments." He said, on illegal logging, one should consider "consumerism," that China imports timber, works on and exports it. We should "lead people," he said, to use less endangered wood. 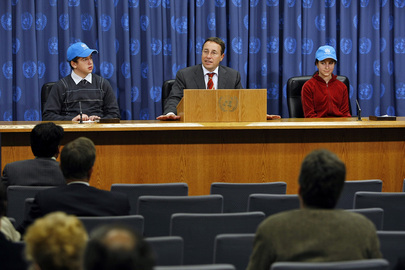 Then, while UNEP's Achim Steiner was responding to or rejecting Inner City Press' question about what UNEP does to measure or verify how many trees are being taken down by the countries it is praising, another member of Minister Jia Zhibang's entourage rushed to the front of the room to make additions, that "there are two aspects... countries are sovereign to use their forests" but since wood that China imports is then exported to other markets, other governments should have adequate safeguards. The argument apparently is that when China imports huge logs from the Congo, contrary to agreements that supposedly require the working of the wood to be done where it is felled, it is the ultimate consuming country that should discover this. Achim Steiner's answer was that UNEP is not in charge of measuring how many trees come down -- he said FAO does that -- but rather, the Billion Tree Campaign is about "empowerment," about people doing things spontaneously. His materials list Myanmar as committing to plant 150 million trees. One wonders how spontaneous that is. Steiner expressed dissatisfaction with the question, saying that the event was about what people are doing. The next speaker, Nobel Prize winner Wangari Maathai, said on the contrary it is an important question, because it goes to the "commitment" of governments. "We cannot commit and then go and do the opposite," she said. UNEP then deigned to take one more question, from a Chinese journalist who asked how much China has spent on the Billion Tree Campaign. 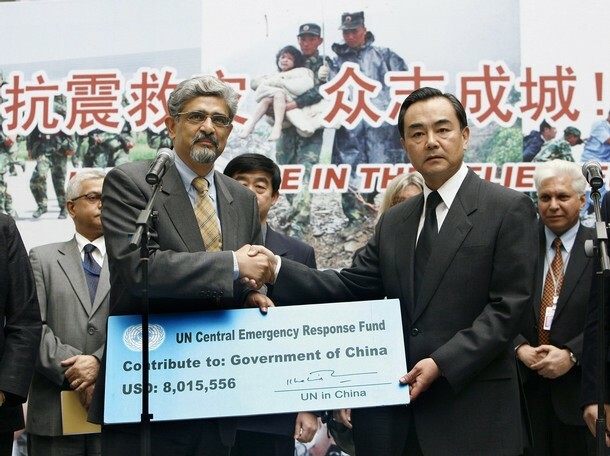 The response included the fact that Hu Jintao himself planted five trees this year. And that it was over. Footnote: Also on the panel was a young boy, Felix Finkbeiner, who made the audience laugh by saying adults talk a lot but do little. He encouraged attendees to take photographs with him -- his photographer was waiting, with a white backdrop and a laptop showing photos of Felix with the UN's Doctor Pachauri, with UNEP "ambassador" Gisele Bundchen. This type of program seems of more interest to Steiner's UNEP than looking at volumes of trees lost before offering praise to countries which are, in fact, destroying forests. And one continues to note Ban Ki-moon's replacement of Anna Tibaijuka by Achim Steiner to head the UN in Nairobi, with the subsequent hoopla about the UN's commitment to women in leadership, and even more questionable commitment to a have a full time Special Adviser on Africa. Watch this site.